Been Plowing a Long Time? Ready for God to Promote You? 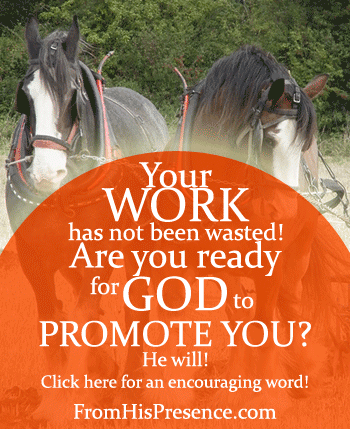 Are you ready for God to promote you? Are you longing for the next thing, but it doesn’t seem anywhere in sight? Sometimes it can be hard to wait on promotion. You’ve been plowing and plowing, working and working, serving faithfully. Years have passed. Your dream is burning in your heart… but sometimes it feels like God has passed you by. Sometimes your dream grows dim, and sometimes it feels dead. Sometimes you even question if God will really come through for you at all. I know. I’ve been there. If you’re there right now, I know how you feel. In times like these, you need RHEMA. (“Rhema” means “the right-now word for you straight from God’s mouth”). Just another encouraging pat on the back won’t do. You need HELP. You need hope. You need the will to go on and believe that God has not forgotten you. You need to know that God has not overlooked your years of faithful service. If you’re in the situation right now that I described above, I have a rhema word for you today. It has two parts. First, please watch the short video clip below from Pastor Bill Johnson of Bethel Church in Redding, California. Then, read the word below that God gave me for you this morning. It would actually be unjust for Him to forget you and not reward your faithfulness by bringing you into His promises for your life. God is just. Justice is actually part of His character, and it is required in order for Him to be God. If God were unjust, then He would be evil, and He could not be God. Righteousness and justice are the foundations of His throne (Psalm 89:14). That means that God would have to give up being God AND LEAVE HIS THRONE in order to not bring you into His promises for your life. It would be unjust, and God would be unholy, if He failed you. So the very core of God’s makeup makes it impossible for Him to let you down. It is impossible for Him to forget you. It is impossible for Him to pass you by. So why hasn’t it happened yet? I don’t know exactly, but I don’t really want to talk about that. What I do want to talk about is how to see your promises happen. Start praying very specifically for the thing God has called you to to happen. Remind God that it is in His very nature that He will fulfill His promise and call for you. Pray for God to give you the character necessary to sustain the dream He has for you. It’s better to be trustworthy than to be trusted. Pray for favor with God and man. Men may grasp for position in the flesh, but God will not honor that in the long run. God builds your ministry by giving you favor. It’s His way. Pray for favor with specific people. Favor never hurt anybody, so even if those people don’t end up being part of God’s plan, the favor will still be fun. Pray for opportunity to do the specific thing you want to do. Pray that God will give you the authority you need to do what He’s called you to at the right time. Pray that God will protect your destiny and the opportunities He has for you. Begin to speak the Word over your life out loud. Confess out loud that you ARE doing the thing God has called you to do. Speak those things that are not as though they already were. When I do these things, I see miraculous progress. When I fail to do them, that progress seems to fade. Are you ready for God to promote you? I bet He’s more ready than you are. It’s Who He is; it’s part of His very nature. So let’s join in together and ask Him to do what He has promised, shall we? Psalm 89:14: “Righteousness and justice are the foundation of Your throne; mercy and truth go before Your face” (NKJV). Image courtesy of Amanda Slater on Flickr (altered to add my post title and slightly cropped). Incredible that both Jamie and Pastor Ron quoted the same scripture. God thank you for your guidanc. I know that when I call to You, You will show me great and mighty things. Whoo! Go Jesus! I had to look up Pastor Ron’s blog when you said that – I love it! Jamie, I’ve printed this to keep in my notebook as a reminder to keep on staying the course, being consistent, being there and being faithful. It is my hearts desire for God to find me faithful in all things. This post moved me and inspired me to be faithful all the time in everything. I pray to be faithful even when the flesh doesn’t want to. Thank you for the sharing the on time word. Praise God! That’s so awesome; thanks for letting me know, Angela! I needed this right now. This was an ontime word and I recieve it! Thank you for the reminder that sometimes the struggle clouds what we know to be true. Amen! Thanks for letting me know! Hugs! Jamie I thank you for this encouraged word today this what I need to hear.. You are truly my Angel. I speak blessings over you and your family.